I always thought the coolest job in the Star Wars universe was one of the guys/gals/fish aliens in charge of a fleet of enormous starships. So little exertion, so much fun. The arrival of the velvet-smooth Grand Admiral Thrawn in the 1990s only cemented this view, yet for all the job's luster, video games have traditionally done a pretty poor job of letting you send thousands of pilots, gunners and crewmen to their deaths. That's OK. Like they often do, board games are here to take up the slack. 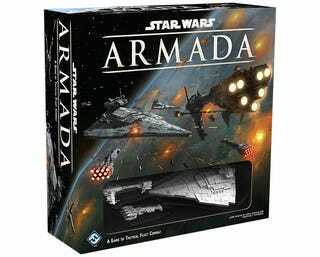 Flush with cash from their X-Wing miniatures game, Fantasy Flight has unveiled Star Wars Armada, "a game of tactical fleet combat". Basically, you control not only giant capital ships, but the squadrons of fighters swarming all around them as well. And there's realistic inertia. And amazing little models of Star Destroyers. The inevitable Mon Calamari/Executor-Class expansions are going to destroy me.